The Colombian army's ties to Triple-A were first disclosed in 1980 in an open letter by five former intelligence officials published in the Mexican newspaper El Día. "La verdad sobre la Triple A"
"U.S. cable ties Colombian military to rights abuses"
Washington D.C., July 1, 2007 - As a growing number of Colombian government officials are investigated for ties to illegal paramilitary terrorists, a 1979 report from the U.S. Embassy in Bogotá raises new questions about the paramilitary past of the current army commander, Gen. Mario Montoya Uribe. 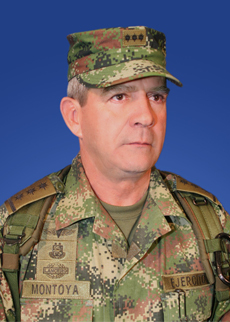 Colombian army commander Gen. Mario Montoya Uribe. The declassified cable, the focus of a new article being published today on the Web site of Colombia's Semana magazine, answers long-simmering questions about a shadowy Colombian terror ogranization responsible for a number of violent acts in the late-1970s and early-80s. Long suspected of ties to the Colombian military, the cable confirms that the American Anticommunist Alliance (Triple-A) was secretly created and staffed by members of Colombian military intelligence in a plan authorized by then-army commander Gen. Jorge Robledo Pulido. Gen. Montoya was first tied to Triple-A by five former military intelligence operatives who detailed the group's operations in the Mexican newspaper El Día. The new evidence tying the Army's 'Charry Solano' intelligence battalion to the terror group is likely to refocus attention on Montoya's role in that unit. The new information follows the publication in March of a secret CIA report linking Montoya to a paramilitary terror operation in 2002-03 while commander of an army brigade in Medellín. Along with previous Archive postings, the article, also published in English on the Archive's Web site, is part of an effort by the Colombia documentation project to uncover declassified sources on Colombia's armed conflict, particularly the illegal paramilitary terror groups now engaged in a controversial demobilization and reparations process with the government. Read the article in Spanish at Semana.com or in English below. Colombia's rapidly unfolding 'para-politics' scandal has renewed focus on official links to the country's illegal right-wing terror groups, especially among the armed forces. The flood of recent revelations, stemming in part from the government's paramilitary demobilization program, has also gravely impacted relations with Washington, holding up a trade agreement and jeopardizing millions in U.S. assistance. Now, a 1979 diplomatic report from the U.S. Embassy in Bogotá raises additional questions about the paramilitary ties of embattled Colombian army commander Gen. Mario Montoya Uribe. Montoya came under scrutiny in March after the Los Angeles Times published information from a classified CIA report linking him to a paramilitary group in 2002. The 1979 Embassy cable, released as the result of a Freedom of Information Act request by the National Security Archive, reveals that a Colombian army intelligence battalion linked to Montoya secretly created and staffed a clandestine terror unit in 1978-79 under the guise of the American Anti-communist Alliance (AAA or Triple-A). The group was responsible for a number of bombings, kidnappings and assassinations against leftist targets during that period. The formerly 'Secret' cable, a review of Colombia's human rights record from U.S. Ambassador Diego Asencio, is also the first declassified evidence that a top Colombian military official directly authorized a paramilitary terror operation. According to the report, then-army commander Gen. Jorge Robledo Pulido approved the plan by the 'Charry Solano' Intelligence and Counterintelligence Battalion (BINCI) "to create the impression that the American Anti-communist Alliance has established itself in Colombia and is preparing to take violent action against local communists." Previously declassified U.S. intelligence reports have revealed that Colombian officers often turned a blind eye to the rightist militias, which are blamed for a large number of massacres and forced displacements in Colombia over the last decade. The Colombian government has long denied official links to paramilitaries, explaining that instances of direct collaboration were isolated and not the result of an explicit strategy. The country's largest paramilitary umbrella organization, the United Self-defense Forces of Colombia (AUC), was added to the State Department's list of Foreign Terrorist Organizations in 2001. The Asencio cable confirms that Gen. Robledo was more than simply acquiescent to paramilitarism and actively promoted the military's direct involvement in rightist terror operations even as the modern paramilitary movement was still taking shape. The document also suggests that many of the young officers involved in those operations like Montoya have risen to influential positions in the Colombian armed forces at a time when the institution is supposedly severing ties with paramilitary groups. Gen. Montoya, now a top military adviser to President Álvaro Uribe, was assigned to BINCI at the time of the Triple-A operation, according to five former members of the battalion who in 1980 detailed the unit's terror operations in the pages of the Mexican newspaper El Día. The officers named then-Lt. Mario Montoya as the mastermind behind the bombing of the Communist Party newspaper Voz Proletaria. The U.S. has examined Gen. Montoya's alleged ties to Triple-A on several occasions as part of a human rights vetting process for recipients of U.S military assistance. In each case, the U.S. found no evidence to support the charges and dismissed them as leftist slander. In a 2000 evaluation, the Embassy's only reference on Montoya's Triple-A connection was the mostly-unsourced 1992 publication, El Terrorismo de Estado en Colombia (State Terrorism in Colombia), prepared by a coalition of international human rights groups including Pax Christi International. Terrorismo largely repeats the charges made in El Día, citing "the confessions of three former military intelligence agents" who said that "Montoya Uribe was part of the Triple A and took part in some of the dynamite attacks." Likewise, a September 1999 Defense Intelligence Agency (DIA) report found "no corroborating evidence" to support Pax Christi's charges about Montoya, then a leading candidate to be named the next armed forces intelligence director. The report characterizes the accusations-including the "dynamiting of communications centers," death threats, assassinations, and other actions against political opponents and perceived guerrilla sympathizers-as "a NGO smear campaign dating back 20 years." In fact, it was 20 years earlier that the U.S. Embassy directly linked army intelligence to the terror operation, and specifically identified the December 1978 bombing of the Colombian Communist Party headquarters as an act carried out by BINCI disguised as Triple-A. The new revelation comes in the wake of a bombshell disclosure by the Los Angeles Times in March of a CIA report that Gen. Montoya engaged in a joint operation with a Medellín-based paramilitary group. 'Operation Orion' was part of a larger military offensive in the city during 2002-03 to attack urban guerrilla networks. The sweep resulted in at least 14 deaths and dozens of disappearances. The classified intelligence report confirmed "information provided by a proven source," according to comments from the U.S. defense attaché included in the document. That report provoked a strong response from U.S. Senator Patrick Leahy, chairman of the Senate subcommittee that overseas Colombia aid, who in April blocked the release of $55 million in U.S. assistance to Colombian security forces. Earlier this month, the U.S. House of Representatives further increased the pressure, dramatically reducing the proportion of U.S. aid going to the Colombian military. U.S. law requires the Colombian government to take steps to sever links to the illegal terror groups. "[T]he new Congress is not going to be a rubber stamp the way the last Congress was," Leahy said in a statement May 2, in which he announced that assistance would be suspended pending an investigation of the Montoya allegations. "We do not want our aid to go to anyone with links to paramilitaries." Allegations of paramilitary collusion have dogged Montoya throughout his career. The discovery of a mass grave in the southern department of Putumayo in March 2007 has raised questions about Gen. Montoya's actions as commander of Joint Task Force South, the US-funded unit charged with coordinating counternarcotics and counterguerrilla operations in that region from 1999-2001. Investigators estimate that the more than 100 victims of paramilitary violence found in the grave were killed over the same two-year period that Montoya led the Task Force. Declassified documents previously unearthed by the National Security Archive also detail State Department concern that one of the units under Montoya's command at the Task Force, the 24th Brigade, had ties with paramilitaries based in La Hormiga, the location of the recently discovered gravesite. One State Department cable noted persistent allegations that a 24th Brigade unit based at La Hormiga had "been cooperating with illegal paramilitary groups that have been increasingly active in Putumayo." Another allegation charges that Montoya and two other officers allowed paramilitary forces to pass through army roadblocks unhindered before a May 2002 guerrilla-paramilitary clash at Bojoya that left more than 100 people dead. Although officially cleared of wrongdoing, the substantive portions of declassified documents pertaining to Montoya's actions in this case were redacted by State Department censors. The revelation of the army's Triple-A operation also underscores the explosive recent testimony of two former AUC paramilitary commanders who said that the Colombian government fomented paramilitary groups in the 1990's, a time when the rightist militias dramatically increased their numbers and influence in the country. The statements are required under the Justice and Peace law, a controversial government program through which many senior paramilitary leaders have demobilized their forces, agreeing to confess their crimes and pay reparations to their victims in exchange for reduced criminal penalties. So far, the testimony suggests that ties between paramilitaries and the government were even deeper than previously imagined, turning the process into a de facto investigation of the state. "Paramilitarism was state policy," said former AUC chief Salvatore Mancuso before a judicial panel last month. Mancuso's statement was an unambiguous indictment of senior government officials-many close to President Álvaro Uribe-in fomenting paramilitarism. The Asencio cable is an important artifact of this hidden history, shedding light not only on a key episode of Colombia's dirty war, but also on how the U.S. confronted the problem of military-paramilitary links during that critical period. The Ambassador's acquiescent approach in 1979 contrasts sharply with the tough line now endorsed by influential members of the U.S. Congress. For his part, Asencio called the Triple-A terror operation a "disturbing development," but felt that the use of tough tactics was a regrettable but inevitable exigency of counterguerrilla warfare. "In the government's war on subversion the military forces are a blunt instrument," he wrote to Washington, "and military operations may have unexpected consequences." Now, the recent revelations about state-paramilitary collusion has produced some 'unexpected consequences' of its own, and as this process continues, the secret archives of the U.S. Embassy will remain a valuable source on Colombia's paramilitary past. U.S. Ambassador Diego Asencio reports on the worsening human rights situation in Colombia as the government continues "a massive operation against the M-19 terrorist group" under a state of siege decreed by President Julio Turbay Ayala. 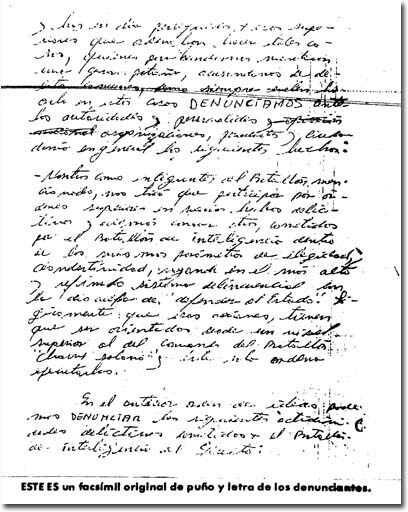 Among other activities associated with the anti-guerrilla crackdown, the Ambassador notes "the delineation of a plan" by the Army's intelligence battalion, and approved by Army Commander Gen. Jorge Robledo Pulido, "to create the impression that the American Anti-Communist Alliance (AAA) has established itself in Colombia and is preparing to take violent action against Colombian Communists." AAA, or Triple-A, was a shadowy, anti-communist terrorist organization responsible for a number of bombings, killings and other violent acts in the late-1970s. Asencio calls the Triple-A operation "a disturbing development," but does not believe that the group's actions constitute human rights violations. Terrorist acts like the December 12, 1978, bombing of Colombian Communist Party headquarters were "more appropriately characterized as dirty tricks," according to the ambassador's report. "The plan was born of the frustration the military felt last fall when little headway was being made in combating terrorist activities and is likely to remain inoperative so long as the armed forces are successful in dealing with the problem by other means." The ambassador further reports that some M-19 detainees were "roughed up" and that security forces threatened one woman "with becoming a missing person if she did not cooperate with the authorities." But Asencio adds that the human rights violations that have occurred are the "result of harsh interrogations performed by individuals acting on their own, rather than as torture or the application of a conscious policy to extract information by torture." "[M]ilitary forces are a "blunt instrument," the ambassador adds, "and military operations may have unexpected consequences." Five imprisoned members of the Army's Intelligence and Counterintelligence Battalion (BINCI) describe actions carried out by the unit under the guise of the American Anticommunist Alliance in an open letter published in the pages of the Mexican newspaper El Día. The officials name then-lieutenant Mario Montoya Uribe among many other Colombian Army officers implicated in terrorist actions directed against leftist political targets. Pax Christi International, et al. This 1992 publication states that "Montoya Uribe was part of the Triple A and took part in some of the dynamite attacks" attributed to the group, citing "the confessions of three former military intelligence agents." U.S. officials evaluating Montoya's human rights record have frequently cited and dismissed the allegations contained in Terrorismo--apparently their sole source on the Triple-A allegations--as leftist propaganda. According to the DIA's biographic report, Gen. Montoya received training at several U.S. military institutions, including the U.S. Army School of the Americas (where he was also a guest instructor), the U.S. Army Armor Advanced Course at Fr. Knox, and other "unspecified" training. His early posts included several stints in Bogotá, Antioquia and in the field of military intelligence. The 1998 report only covers career postings after Montoya attained the rank of major, and thus says nothing about Montoya's assignment to the BINCI battalion as a relatively young army lieutenant. This 1999 report from the U.S. defense attaché in Colombia states that Montoya, then the "top candidate" to become director of military intelligence, "has been the target of a baseless NGO smear campaign." Contained in its six sentences of uncorroborated allegations, Pax Cristi accuses the Triple-A of 'dynamiting communications centers, death threats against members of political opponents and assassinating members and sympathizers of insurgent groups.' Furthermore, the report charges that three ex-military intelligence agents who were former members of the "Charry Solano" intelligence and counterintelligence battalion, indicated that Montoya was a member of the Triple A, and took part in the dynamiting. The report provided no corroborating evidence to support these allegations. Under a 1997 agreement, the U.S. required units and individuals slated for U.S. assistance to be vetted for human rights violations. In this cable, the U.S. Embassy requests that State Department officials in Washington undertake a review of the human rights records of the "command element" of Joint Task Force South, a U.S.-funded military unit with "operational command" of several important counternarcotics and counterinsurgency brigades in southern Colombia. The document dismisses the charges made against Gen. Montoya in Terrorismo de Estado, calling them "unsupported" and "baseless." On May 11, 2000, the first company of soldiers from the U.S.-supported First Counternarcotics Battalion was deployed to southern Colombia and was under the operational control of Joint Task Force South (JTF-S), then under the command of Gen. Montoya. The unit was then spearheading the military’s counternarcotics campaign in Putumayo and other areas. In this cable, U.S. Ambassador Curtis Kamman feels compelled to flag for the State Department that the battalion is operating alongside and with the support of the army’s 24th Brigade, a unit denied U.S. security assistance in 1999 due to human rights concerns. In this cable, the State Department forwards talking points to U.S. Ambassador Curtis Kamman detailing how he should approach the Colombian Minister of Defense about U.S. concerns over allegations of human rights violations by members of the Army’s 24th Brigade, then a component unit of Joint Task Force South, the U.S.-funded unit led by Gen. Montoya. The Brigade, considered a vital component of U.S. counternarcotics strategy in southern Colombia, had recently been accused of several human rights crimes, including the execution of three campesinos detained at a roadblock near San Miguel, Putumayo. The 24th Brigade was denied U.S. assistance in September 2000, but continued to act as an integral part of Joint Task Force South, the command spearheading the first phase of “Plan Colombia,” and which would eventually include all three U.S.-supported counternarcotics battalions. In his talking points, the ambassador is told to stress “persistent reports that the 24th Brigade, and the 31st Counterguerrilla Battalion in particular, has been cooperating with illegal paramilitary groups that have been increasingly active in Putumayo.” As noted in the previous document, the Bravo Company of the U.S.-backed First Counternarcotics Battalion had been bunking with, and receiving logistical and other support from, the 31st Counterguerrilla Battalion and the 24th Brigade since it arrived in Putumayo on May 11, 2000.